Our kitty, Squeek, turned 15 years old yesterday. 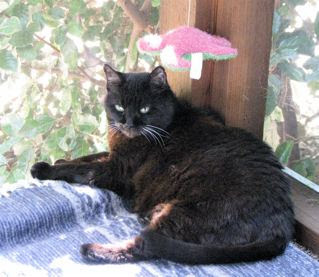 For an FIV cat, that's great news! Her special treat was a hard-boiled egg yolk, mashed and mixed with water. She gobbled it up. We keep things rather simple here and she seems to appreciate that also. The little toy hanging above her head was given to her by my friend, Robin, many years ago. She still enjoys playing with it. Each cat has particular "games" they enjoy. For Squeek, aka Kitty Girl, it's reaching up and batting at something, whether a toy or a string. I tie a very long shoelace on the back of the porch chaise that she enjoys rolling around with. 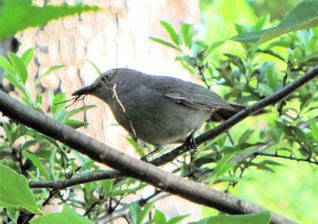 After knowing that the Gray Catbirds' nest had been emptied most likely by a snake (the down side to getting an up-close view of nature in our backyard), I wondered where they would try to nest again. This happened last year also and they do build again. Such a picture of trusting God and moving on with life, believing that all things happen for good to those who love Him. Yesterday we were sitting on the screened porch for a morning business meeting and I saw them carrying in twigs and dried grass to the bushes that are alongside our porch. There are three huge bushes there that the birds love for cover since they're pretty dense. We planted them as a privacy screen for the porch and they've been grand. The only problem is that we often see a black rat snake around this area. Matter of fact I saw one two days before I saw them building the nest. An interesting thing is that these bushes are on the side of the porch that our kitty loves to lay in the corner. Shaded by the bushes and the comfort of a blanket I've placed there makes it one of her favorite snoozing spots. You would think the birds would not want to nest near a cat, but this couple has probably been around here for years and knows the routine of this sleepy cat that isn't allowed outside. Their choice is a great one for me since the male sings long songs to the female and sometimes she sings them back in a much softer voice. They remind me of a mockingbird with a nasal allergy. I love hearing their arias. Better than some operas we've seen. What to do! I don't want to disturb nature. So, I do the only thing left ... pray over the nest and situation. I will continue to do that daily as I never go a day without being on the screened porch. I will ask Papa to watch over His birds and provide the snakes meals elsewhere on the property, out of my sight. Two of this year's baby squirrels must've rehearsed quite a roll and tumble to entertain me one day. It was priceless laughter! We have two vinyl Canada Geese in our yard and the squirrels seem to enjoy jumping up on one to eat a nut now and then, which usually causes it to tip back to rest on its tail. One day these two little ones decided to play "King of the Goose" for quite some time. After watching for awhile I went on the deck to take a brief video which didn't deter their antics a bit. They were hilarious pulling each other down and sliding off together with all legs wrapped around the other. Laughter is great medicine, so view the video and giggle a bit. Upside Down House for Carpet and Paint - Oh My! I always work on my photos on a "first in, first out" basis, so I'm not yet to the photos of our day's outing in the Shenendoah Valley, but will get that post up as soon as I do work them. We've been having our house carpeted and painted and everything is turned upside down, so my energy has been used elsewhere. I feel like I've moved. The painting is scheduled to be done by next Wednesday. I am hoping! At least it's given me another opportunity to clear out some files and unused items. I'm not a stuffer so if it's not being used, it goes. So far my track record has been pretty good on not needing anything I move out. The bullfrogs we have seem to both be female. I've only taken photos of each of them separately and thought we had a male. However, it seems we may not, which is a huge blessing since bullfrogs are big eaters and don't really belong at a pond our size (5' x 8'). The big pond which is behind the houses across the street had damage and was drained, so I suppose they traveled until they saw ours and decided to camp. 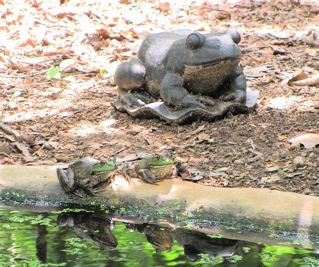 We have a variety of frogs and toads that lay eggs in our frog pond, along with dragonflies and damselflies, and of course a host of insects that I don't even know that live in the pond. So to keep the pond healthy, we need big eaters to moderate themselves, so we're happy that we've seen no bullfrog eggs or tadpoles. Speaking of frogs, one evening I was on the screened porch and one of our Eastern Gray Tree Frogs was on the screen watching the moths attracted to it due to the light being on. These seemingly small tree frogs sure have long legs and when they begin chasing you get to see how long they are. View video of tree frog and moth. Our Joe Pye Weed is now 12 feet tall and growing. It's been budding, so we will have plenty of huge blooms for the butterflies that love it so much. We planted it at one of the downspouts so it would be a wet area for them. I also have Creeping Jenny under it. I guess you'd call it a rain garden since it absorbs the spout runoff so we don't have to use any of those downspout drainers on the ground which divert water away from the house, but still create gullies from the water pouring out from them. So, we've planted specific wet-loving plants in front of ours to absorb the water naturally .... no more gullies or drainers. On one of our downspouts we had a row of bushes only a foot from it, so Randal dug a trench in front of the bushes and lined it with some rock and then put 12 feet of black plastic tubing with holes that he attached to the downspout, so the water coming out of it would be underground watering those bushes. That was really cool. In our area water is expensive so it's also a great frugal and green idea. 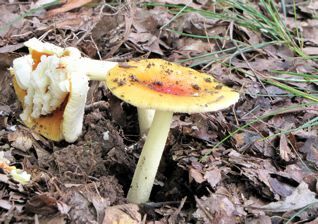 Speaking of wet areas, we've had plenty of rain this year and that has brought out a lot of different mushrooms which have been a delight to discover. Since they just "pop out" all of a sudden, they are always unexpected because they weren't there the day before. Strolling about our habitat is always an adventure. So many birds to entertain us and the squirrels always leave evidence of their play times in some way or another. I work outside and get to catch a lot of what goes on. Sometimes it's hard to go to bed wondering what sounds I will miss while I'm asleep. Wednesday night was like that. 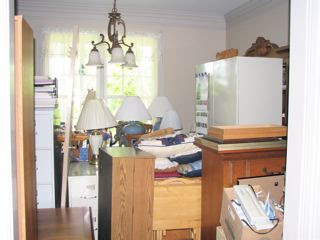 I had spent quite a bit of time inside getting the office back in order and when I finally went to brush my teeth, the night sounds poured through the door of the screened porch which is in our bedroom. After getting ready for bed, I spent a bit of time with my Father just looking at the night sky and moon that He made to give us light at night. The heavens declare His handiwork and all Creation praises Him. I sometimes feel I was created to live outdoors. I am so alive outside and while I'm inside, there's a part of me that seems to shut off. Anybody else like that out there!? Tell me about it in the comments section of the post - at the bottom. Are you traveling this summer? To Virginia? 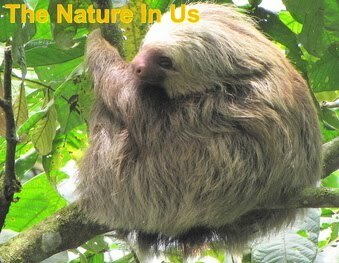 I love to see The Nature In Us friends come by for a stroll through our habitat and a cup of tea. Visitors are always welcome ... with advanced notice ... we do work at home, but we are good at scheduling play time. So there's a porch chair waiting for you and a table for tea time. May you be filled with amazing joy and everlasting peace. Woodpeckers Rapping on Your Home? 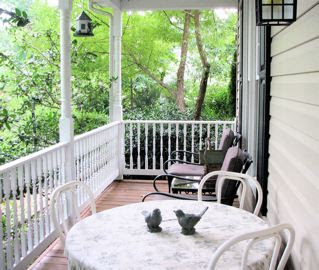 I sure would love to come sit on that porch with you...and to go to Virginia. This year though, I'm saving my pennies to go to a September Wedding in Australia. You get much better photos of your black cat than I do of my black Bagheera!